A response to Patrik Öhberg. 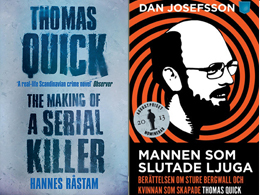 Patrik Öhberg’s review of two books on the scandalous Bergwall case in Sweden (“The Serial Killer who Never Was,” Inroads, Winter/Spring 2015) illustrates how, even in a modern sophisticated society, huge mistakes can be made when people with a stake in a given outcome use whatever they can to justify their position and avoid facing facts. To explain Bergwall’s failure to get key facts right about the murders to which he (falsely) confessed, Swedish prosecutors relied on his “repressed memories,” tracing these to Bergwall’s unsubstantiated story of horrific personal childhood abuse. The article suggests that it is most typically in therapy sessions that victims remember abuse they had experienced long ago as children. Öhberg contrasts this with the assertion that genuine victims of trauma do not seem to repress their memories, and that studies of Holocaust survivors found that victims had quite clear and accurate recollections of details and names. While there have, unfortunately, been some documented cases of “mistaken memory,” the bulk of the evidence negates this as a common occurrence. Dissociative amnesia is a well-established phenomenon and its documentation goes back as far as Freud. Most therapists do not attempt to elicit information independently provided by patients or clients. Rather, adult survivors’ memories were triggered by various life events, having no therapeutic connection at all, and often corroborated by family members and others who had maintained silence until then for varied reasons. The article cites a 1974 study by Elizabeth Loftus to show that memories can be easily manipulated. In the study, witnesses to a video car crash assessed the speed of cars differently depending upon whether the interrogator used the word hit or smashed. But it is inaccurate to jump from this and similar study results to the generalized conclusion that childhood memories of abuse are unreliable as a result of therapist influence. Simplistic examples of memory as in the Loftus study are simply not relevant to complex formation (and subsequent loss at times) of memories created and stored under circumstances of severe trauma. The case of Holocaust survivors needs to be nuanced. Significant numbers (while smaller than for childhood abuse) did in fact experience amnesia for some or all of their trauma experiences, at various times during their recovery. Moreover, since a significant majority of Holocaust survivors came from loving and stable families before the Nazi horrors, they had less need for protective dissociation and amnesia than young victims of childhood family abuse, where the abuser(s) who should have provided parental nurturance, safety and love did just the opposite. There are many who genuinely need valid therapeutic help – and the understanding and support of some family and friends. Past examples of occasionally inappropriate therapist influence should not blind us to the healing potential of valid therapy in real cases of dissociative amnesia.